The United States Open Tennis Championships, which started in 1881, is one of the sport’s four Grand Slam events (the other three are the Australian Open, French Open and Wimbledon). Open also means that the event is “open to change.” And, yes, what changes this year. For the first time since the 2005 Australian Open (when Marat Safin defeated Lleyton Hewitt) — that’s 10 years this January — someone not named Novak Djokovic or Roger Federer or Rafael Nadal will contest a grand slam singles final. That’s how dominant these three have been. This is exciting. It’s new. “For a change,” we call this. Because while all predictions pointed to a Djokovic-Federer final, the opposite happened: it’s Kei Nishikori and Marin Cilic in the Men’s Finals today, played at 5 a.m. (Phil. time). My pick? Who else… but our fellow Asian. Standing only 5-foot-10, Nishikori will be dwarfed by the 6-foot-6 Cilic when they meet. It’s the first time in tennis history that an Asian-born man has reached a major final. If he wins, then the accomplishment becomes bigger. The person coaching Kei? He’s also Asian — by blood. Michael Chang, born and raised in the U.S., won the French Open as a 17-year-old. This was in 1989. 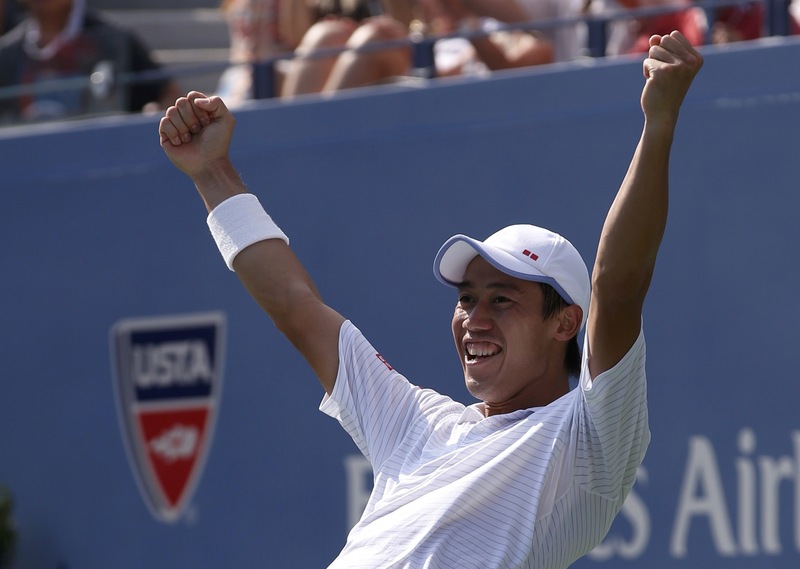 Imagine if, 25 years later, Chang’s student (Nishikori) wins today? The all-star coaches line-up isn’t limited to Chang coaching Nishikori. The mentor of Cilic is a former Wimbledon winner, Goran Ivanisevic. The losing semifinalists, even more star-studded: Novak is coached by Boris Becker while Roger has Stefan Edberg. These four coaches own 14 major titles between them. With the Kei-Marin final today, the head-to-head has the Japanese leading the Croatian, 5-2, and Kei winning their last three meetings (including twice this year). En route to the US Open final, he downed Milos Raonic, Stan Wawrinka and Djokovic — three of the toughest. This points to an easy win by the Asian, right? Not so fast. Cilic dismantled Federer last Saturday. While tennis experts predicted an RF victory in NYC (his 18th major, same with Serena Williams) — mainly because he escaped those two match points in the quarterfinals against Gael Monfils — Cilic had other plans. He embarrassed Roger with a clinical 6-3, 6-4, 6-4 win in just 105 minutes. He, too, is supremely confident. The key of the match is Cilic’s serve. Against Roger, he served three straight aces in the final game. He was untouchable while tossing that ball and blasting 132-mph aces. If he serves the way he did against Roger, he’ll win. But if his first serve percentage dips and the points last longer, I tip the favor on Nishikori. Go, Japan! SERENA. Fifteen years ago, my dad Bunny and I were at the US Open as we watched a 17-year-old win her first major title. Now aged 32, this same girl has won a total of 18 majors. (Her finals opponent then, in 1999, was Martina Hingis — who lost the women’s doubles the other day.) Given her hunger and athleticism, Serena Williams is on her way to breaking the records of Helen Wills Moody (19 majors), Steffi Graf (22) and Margaret Court (24). IPTL. Tickets to the Nov. 28 to 30 meet featuring Maria Sharapova, Andy Murray plus many other top names are now available. For now, they’re selling “season passes” to all three days. They range from the least-expensive (P2,500) to the highest-priced (P49,000). They’re not cheap. Venue is the SM MOA Arena and tickets are available at smtickets.com.